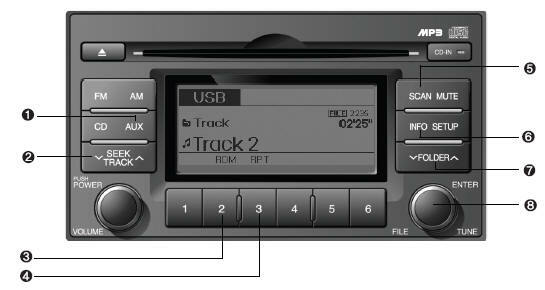 If the auxiliary device is connected, it turns to AUX or USB mode to play the sound from the auxiliary player. If there is no auxiliary device, then it displays the message "No Media" for 3 seconds and returns to the previous mode. o Press the [TRACK ] button for less than 0.8 second to play from the beginning of the song currently played. Press the button for less than 0.8 second and press it again within 1 seconds to move to and play the previous track. Press the button for 0.8 second or longer to play the song in reverse direction in fast speed. o Press the [TRACK ] button for less than 0.8 second to move to the next track. Press the button for 0.8 second or longer to play the song in forward direction in fast speed. Press the button for less than 0.8 second to start or stop the random playback of the songs in the current folder. Press the button for more than 0.8 second to randomly play the entire songs in the USB device. Press the button again to cancel the mode. Press the button for less than 0.8 second to repeat the song currently played. Press the button for more than 0.8 second to repeat the entire songs in the USB device. Scans each song in the USB device for 10 seconds each. Press the button once again to cancel scanning. o Press [FOLDER ] button to move to child folder of the current folder and display the first song in the folder. Press TUNE/ ENTER knob to move to the folder displayed. It will play the first song in the folder. o Press [FOLDER ] button to move to parent folder display the first song in the folder. Press TUNE/ENTER knob to move to the folder displayed. Turn this button clockwise to display the songs ahead of the currently played song. Turn the button counterclockwise to display the songs before the currently played song. o Press the button to skip to and play the selected song. o Pressing the button changes the BASS, MIDDLE, TREBLE, FADER and BALANCE TUNE mode. The mode selected is shown on the display. After selecting each mode, rotate the Audio control knob clockwise or counterclockwise. o To use an external USB device, make sure the device is not mounted when starting up the vehicle and mount the device after starting up. o If you start the vehicle when the USB device is mounted, it may damage the USB device. (USB is not ESA) o If the vehicle is started up or turned off while the external USB device is connected, the external USB device may not work. o It may not play inauthentic MP3 or WMA files. 2) It can only play WMA music files with the compression rate be tween 8Kbps~320Kbps. o Take cautions for static electricity when mounting or dismounting the external USB device. o An encoded MP3 player is not recognizable. o If you dismount the external USB device during playback in USB mode, the external USB device can be damaged or malfunction. Therefore, mount the external USB device when the engine is turned off or in another mode. o Depending on the type and capacity of the external USB device or the type of the files stored in the device, there is a difference in the time taken for recognition of the device, but this is not an indicator of trouble and you only have to wait. o Do not use the USB device for other purposes than playing music files. o Use of USB accessories such as recharger or heater using USB I/F may lower performance or cause trouble. o If you use devices such as a USB hub you purchased separately, the vehicle’s audio system may not recognize the USB device. Connect the USB device directly to the multimedia terminal of the vehicle. o If the USB device is divided by logical drives, only the music files on the highest-priority drive are recognized by the car audio. o Devices such as MP3 Player/ Cellular phone/Digital camera and those that are not recognizable by standard USB I/F can be unrecognizable. o USB devices other than standardized goods (METAL COVER TYPE USB) can be unrecognizable. o USB flash memory reader (such as CF, SD, microSD, etc.) or external- HDD type devices may be unrecognized. o Music files protected by DRM (DIGITAL RIGHTS MANAGEMENT) are not recognizable. o The data in the USB memory may be lost while using this AUDIO. It is recommeded to back up important data on a personal storage device. o Please avoid using USB memory products which can be used as key chains or cellular phone accessories as they could cause damage to the USB jack. Please make certain only to use plug type connector products as shown below.